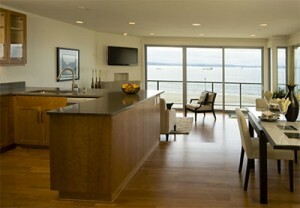 The 1350 Alki Condominium (website) project is one of the newer developments along Alki Avenue SW. This boutique condo features only ten homes with two units per floor. Nine of the ten homes are still available, which range in price from $699,900 to $949,500. These prices reflect a recent price reduction between $40,000 to $60,000, depending on unit. On the other hand, these units have been on the market for nearly a year now. One of the greatest benefit this development offers is its location along Alki Avenue. Just step outside the front door and you’re right on the walk/jog/bike/rollerblading pathway along the waterfront, Alki Beach and numerous shops, cafes and restaurants. Haven’t the 1350 Alki condos gone to foreclosure? Do you know who we would contact about that? We saw these units last year and remain interested, but not at the above prices. We own our home outright in Issaquah and have watched the value drop from nearly $700k to something like $575k. If you’re willing to take offers, then let me know. Thanks.